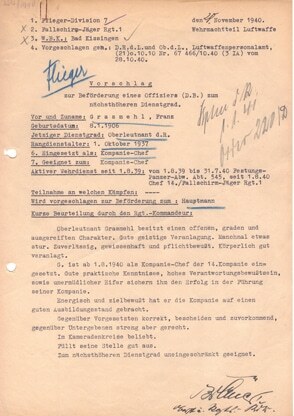 Vorschlag zur Beförderung (Proposal for Promotion) for Franz Grassmehl. The report misspells his last name, but is quite complimentary of his abilities. 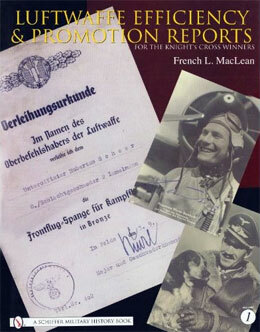 The year after this report, he led his unit in the airborne invasion of Crete and later commanded the 4th Fallschirmjäger Regiment. In 1944 he won the Ritterkreuz (Knights Cross) for his epic defense of Cassino. He later fought in the Reichswald, winning the Eichenlaub (Oak Leaves.) Grassmehl was born on January 8, 1906 at Mochow, Brandenburg; he served in the German Army in the campaigns against Poland and France in 1939, 1940, respectively. Franz Grassmehl died on June 30, 1985 at Stade an der Elbe. He is buried at the Friedhof Geestberg (Section 11, Grave 97.) Documents in both volumes are photographed in their original German and then translated.